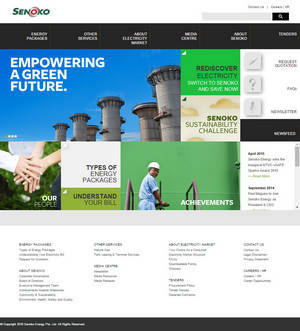 Senoko Energy Pte Ltd is Singapore's largest and most efficient power generation company, providing more than a quarter of Singapore's electricity. Since 1976, we have been serving Singapore's power generation needs, and have established a strong reputation as a reliable and dependable market leader. Senoko is the first genco in Singapore to import piped natural gas from Malaysia; the first to repower our plant; the first to adopt combined cycle technology; as well as the first genco to be certified ISO 9001, 14001 and OHSAS 18001. Senoko Energy is owned by an international consortium comprising Marubeni Corporation, ENGIE S.A., The Kansai Electric Power Co., Inc., Kyushu Electric Power Co., Inc. and Japan Bank for International Cooperation. Senoko Energy has three subsidiaries: Senoko Energy Supply (SES) Pte Ltd, a leading retailer of electricity and related services; Senoko Services Pte Ltd (SSPL), a provider of fuel storage tank leasing and terminal services; and Senoko Gas Supply Pte Ltd, a gas operations company. Copyright © 2018 Samuel Liew. All rights reserved.